"Dale Neal has given us a testament to the power of story to transform our ordinary lives into something much more. A fine tale-actually, two-well told. What could be better?" Cow Across America is the winningly improbable story of two young men who set out walking to California with nothing but their wits and a milk cow named Ivy. That's what Dwight Martin is told growing up in the 1960s. He's bored to tears spending the summer on his grandparents' Carolina farm. Dwight finds comfort in the wild yarns spun by his grandfather, Wylie Rominger, who boasts the adventure stories are true - and he makes Dwight pay to hear each successive chapter. These unlikely exploits see the boys swept up the Mississippi River, falling into Indian graves and finding a secret shortcut through the Grand Canyon. As Dwight grows to manhood, he discounts the tall tales and angers the old man. His parents divorce. He makes his first attempt at wooing a young woman. Despite his modern misgivings, he can't ignore the pull of those stories as he comes to grips with his own yearnings. "The award judges chose this novel not only for its confident storytelling and abundant humor, but for its deep and surprising resonance," said NFP publisher Amy Rogers. 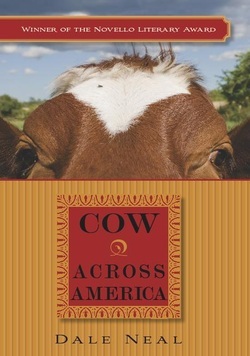 "Cow Across America will engage a wide audience of readers who have wrestled to find their own definitions of family, reconciliation and redemption." Inspired by the raucous humor of Mark Twain and tapping into American pop culture of the 1960s and '70s, Cow Across America is a book about the hopeful power of stories to link the generations.